Rotomolding and Slush molding are unique plastic processing techniques used to manufacture large plastic products, including: Rotomolding products, such as water and chemical tanks, automotive fuel tanks, children's play equipment, and canoes, in addition to Slush Molding products, such as automotive interiors and dashboards. 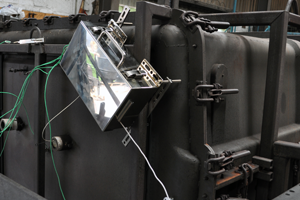 The processes involve forming the plastic product in a large heated mold. Polymer granules are added to the mold, which melt and form a skin on the internal surface of the mold as it is rotated inside the oven. After thermal processing, the mold is cooled and the finished formed product is removed. Different polymers can be used in Rotomolding, such as Polyethylenes (LDPE, HDPE), ABS, Nylon, and Polypropylene. Each polymer has its own unique thermal characteristics, so the process heating cycle needs to be optimized for the polymer used. The Rotomolding and Slush processing procedures are temperature critical, during both the heating and cooling cycles. To guarantee that the plastic product has the required physical strength, appearance and life expectancy, it is critical that the polymer experiences the correct temperatures to accurately perform polymer melt, fusion and crystallization of polymeric structure. Processing requires the ability to monitor the internal mold, mold surface and oven ambient temperature (in real-time) to allow control of the process cycle and determine exactly when critical process temperatures are achieved.